Known for their highly addictive disco edits, the mysterious duo with only a leopard for a logo have gone under various aliases to produce their releases on own label, Editainment. Their tongue-in-cheek names giving Joy Orb a run for his money have varied from Cleo & Patra, and Pop & Eye, disguising their identities whilst they bang out the tunes. Check out the amazing Can't Let Bluto for a taste of what's to come from their set as part of the prestigious Red Bull Music Academy's alumni. The cream of the crop of what might be commonly/vaguely/misleadingly classed as 'Witch House', electronic producer oOoOO dabbles in eerie, ethereal sounds focused around pop sentimentalities, remixing the likes of Britney Spears and sampling girly vocals into freakish sounds of the afterworld. Asides from running his label Clown & Sunset to release inexplicably beautiful music from his equally young buddies (currently all standing at 20-years-old or under) - the New York based musician is famed for his off-beat electronic music with a blatant disregard for genres. Jaar has been highly lauded for his discordant and emotive music, influenced by anything from hip hop to Ethiopian jazz and his enigmatic shows backed by a live band as showcased at Fabric this year, are unmissable. Playing parties for the Streets of Beige crew, and festivals like Dour and Stag & Dagger, the young London-based beatmaker Ghostpoet has caused a storm with his laidback soundtracks to the capital, skilfully blending experimental hip hop sounds with his charismatic vocals sounding like a modern day beatnik. Working with the likes of Macchu on tracks entitled 'Cash & Carry Me Home', 'Peanut Butter Blues & Melancholy Jam', and 'Survive It', he's also seen remixes by Koreless and Alex Patchwork. Recently signed to the cult Numbers label, Deadboy who started out with more dub-inflected tunes and grimey sounds, has as of late also delved into more deep house directions with his latest EP 'Wish U Were Here' on the Glasgow/London-based imprint. Out at Sonar he'll be playing as part of their team alongside Jackmaster, Redinho, vocalist Jessie Ware, Spencer and Lory D.
Perhaps best known as Hotflush Recording's head honcho, Scuba aka Paul Rose, has been one of the key players shaping the UK's electronic music scene over the last few years signing the likes of Joy Orbison, George Fitzgerald, and Sigha early on. Also releasing under the alias of SCB for his more techno-orientated productions, the man behind 'Triangulation' has been the of most prolific, bringing out lush glitchy modern dubstep, remixing the likes of Mount Kimbie and Emika, as well as his own productions on Will Saul's AUS and Berlin's infamous Ostgut Ton. Having formed his label Werk Discs to sign sonic geniuses like Lone and Zomby, as well as providing a platform for self-releasing his uniquely dense and experimental debut album, 'Hazyville', the mysterious Actress has also worked under anonymous aliases that got the better of everyone's curiosity, such as Thriller with heavily distorted samples, influenced by Detroit and Chicago. With perhaps the best artist name ever, Actress (aka Darren Cunningham) followed up with 'Splazsh' on Honest Jon's known for their eclectic but prestigious roster. Catch the enigma as part of the 'On'-Sonar showcases. With hauntingly epic, drop-speed tracks on an R'n'B tip, Manchester/Berlin's Holy Other will be playing as part of Tri Angle Records' roster out at Sonar this year alongside How To Dress Well. Having remixed the likes of Magick Mountain (of The Pop Manifesto) and Asobi Seksu, the producer's debut track 'Yr Love' on Transparent was an eerie downtempo affair not to be missed. 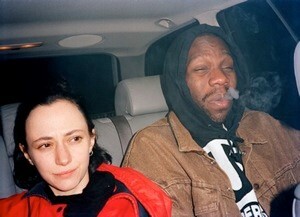 Having made their name on infamous New York label Hippos in Tanks, Hype Williams' album "One Nation", was a trippy, synthy, electronic dub affair that prepped them before embarking on their special series of live "sessions" around Europe this season. As it's what the band claim will be their first and last full-scale tour, they'll be hitting Plastic People in the UK/Ireland and Switzerland with Lee Perry, before culminating in a final blowout at Sonar. Thursday June 16th - Sunday June 2011; Barcelona, Spain.